Dalle ore 00:00 UTC del 27 Maggio 2018 alle 23:59 UTC dell’8 Giugno 2018. Ogni stazione valida per il diploma passerà l’ RS(T) seguito dal numero progressivo di QSO partendo dal numero 001 e andando avanti senza distinzione di data, banda e modo. Non è necessario lo “stop orario”. in alternativa copia cartacea od elettronica dell’attestato di pagamento da effettuarsi tramite ricarica carta Poste Pay – nr 5333 1710 3948 7638 intestata a Giuseppe Brucato, bonifico bancario a IBAN IT50A0760105138202828802838 oppure On-line mediante Carta di Credito o Conto Paypal per l’importo complessivo di 12 euro oppure 17 dollari Usa (comprensivo delle commissioni bancarie) utilizzando il relativo pulsante “Pay Now” presente nella sezione dedicata al Diploma del sito http://www.arialbino.it “pay now” . Per qualsiasi informazione o chiarimento contattare l’Award manager IZ2JQP – Luca della Sezione ARI di Treviglio all’indirizzo mail lucao.erbisti@gmail.com. open to Italian and foreign stations OM/YL/XYL and SWL. Starting on May 27th, 2018 at 00:00 UTC until June 8th, 2018 at 23:59 UTC. 2, 6, 10, 12, 15, 17, 20, 30, 40, 80, 160 meter. 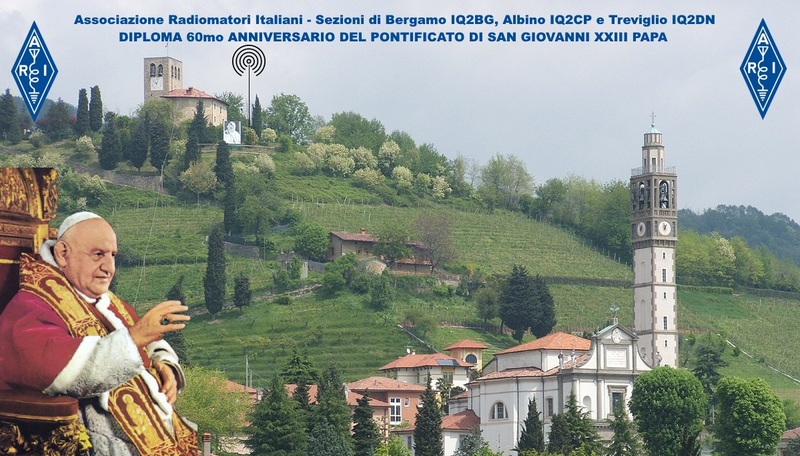 On May 27th 2018, starting with 08:00 UTC until 16:00 UTC, for award opening, there will be three active memorial stations, active in the planned modes and bands, from Colle San Giovanni to Sotto il Monte (BG), with call signs IQ2BG/P, IQ2CP/P and IQ2DN/P, by connecting those, for the chance, there will be the extraordinary attribution of 8 points. 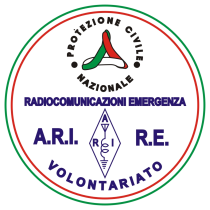 Following this, for the whole Award duration, stations have to be contacted, members of the ARI Clubs of Bergamo, Albino and Treviglio. The same station can be contacted several times, but in different days, or in the same day, but in different bands and/or modes. During the Award there will be active Club “Jolly” Stations, with the call signs IQ2BG, IQ2CP and IQ2DN. The complete list of the club ARI members participating to the Award, will be published on the web sites www.aribg.it, www.arialbino.it and www.aritreviglio.it , in the parts dedicated to this Award. For CW mode “CQ Award J23”, for the digital modes “CQ AWARD J23”, and for SSB “CQ AWARD J23”. QSO in SSB: the contacts or SWL-reports with Jolly stations (IQ2BG, IQ2CP and IQ2DN) will count for 5 points; all other contacts will count for 1 point. QSO in CW, RTTY and PSK31: the contacts or HRD with Jolly stations (IQ2BG, IQ2CP e IQ2DN) will count for 6 points; all other QSO/HRD will count for 2 points. Every station valid for the Award, will send the RS(T) followed by a QSO’s serial number, starting from 001 and going on without distinction of Date, Band and/or Mode. “Stop-Time” is not needed. Italian Stations will need 20 points or 15 HRD (SWL reports). Other European Stations will need 15 points or 10 HRD (SWL reports). All remaining Stations (Rest of the World) will need 10 points or 8 HRD (SWL reports). All request of Award Certificate by standard Mail or eMail, shall arrive within July 31st, 2018. Contacts Log in ADIF format or text file, where will hav to be clearly indicated operator’s information (Name, Surname, complete Address) and all data concerning the established contacts (QSO) i.e. Date, Time (UTC/GMT), Mode, contacted station’s call sign, sent report, received report and received progressive serial number. the cash amount of 10 Euro or 15 US-Dollars (IRC or stamps, not admitted). or through Credit Card or Paypal, for the total amount of 12 euro or 17 US-Dollars (including bank commissions) using the specific pushbutton “Pay Now” that you can find in the section dedicated to the Award, on the web site of http://www.arialbino.it “pay now” . The Award will be sent by SurfaceMail or AirMail, or as annex file in PDF format (please specify in your request the type of delivery you prefer). QSL Delivery: All stations which will have a QSO with the Awards participants, independently from the points needed to obtain the Award or by the request of obtaining the Award, will receive via Bureau a special commemorative QSL. There is no plan of sending direct QSLs, if not jointly to delivery of a requested Award. The management of the QSL delivery is in charge to the ARI Club Bergamo, and the QSL Manager is Ezio IK2AHB. For any needed information or clarification please contact the Award Manager Luca IZ2JQP, of the ARI Club of Treviglio, at the eMail address lucao.erbisti@gmail.com. The organization of the Award is managed by the Joint Organizing Committee of the ARI Clubs of Bergamo, Albino and Treviglio, and every its decision will be unappealable. Articolo precedente Quanti radiali ci vogliono per un’antenna verticale ?